Link: World markets slump as panic grips the banking sector | Business | guardian.co.uk. I love the way the Guardian's journalists slag bloggers off as irresponsible and then write such tosh as the linked article. If I jumped off a cliff, fell 5% of the height and landed on a ledge, would you say I had "plunged". If you had a dollar and lost five cents of it, would you consider your wealth to have "slumped?" I do not say markets will not fall further. Nor do I say that further banking institutions will not fail. Indeed, in my opinion, there are several that should. I simply feel the most interesting facts of the day are not being highlighted. Firstly, American democracy works. Ours doesn't. We can debate whether the US voters were wrong not to want to pay $5,000 per man, woman and child to prop up failing banks around the world. When they called their Congressmen and told them what they thought, however, the politicians did as they were told. Show me a European country where the peoples' voice counts to that extent. In a way it's amusing. Had the vote gone through, I doubt any German bank shareholders would have said "danke." More likely they would have continued to bask in schadenfreude and talk about the end of "the anglo-saxon model." Now they can use their own money to prop up their banks, if that's what they believe is right. Secondly, this is not a US phenomenon. Per capita, UK personal indebtedness is worse than that in the US. German, Belgian, British banks and those of many other nations were up to their eyebrows in practices which - if not unethical - were stupid. Standards of prudence fell in originating deals because securitisation meant the risk was immediately laid off to many others. Once the originating bank would have carried the risk itself. Americans invented these concepts (and though n0-one else will say so now, they were not entirely bad ones). Americans were not alone however in degrading those concepts by allowing prudential standards to fall. Thirdly, this is not just about unemployed borrowers in Alabama. It is about doctors, dentists, lawyers and teachers in the English Shires re mortgaging their houses to pay for short term expenditures. Anyone who bought a 4x4 or paid a school fee with remortgage proceeds helped create the "toxic" securities that the press now howls about. Any dinner table wise guy who thought he was smart enough to become a buy-to-let rentier is responsible. Everyone thinks they can do real estate investment, just as everyone thinks they can manage a football team. No amateurs every seem to notice that both tasks more often than not make fools of experts. They rarely make experts of fools. Fourthly, the falls in share values so far are not nearly enough. Banks in particular are overvalued to the extent that they have loaned to the uncreditworthy against overvalued security. Their shareholders need to take their cold bath in silence. Examine the relationship between increases in earnings and those in house prices, for example. Those two lines can never diverge much or for long - for obvious reasons. Yet they have behaved in the last decade as if they were entirely unrelated. If you want to know how much your house price will fall, calculate what it is worth when that relationship has been re-established. If that's bad news for you, I am afraid there is worse. Markets tend to over-correct. However sorry I may be for you, it's YOUR bad news, not anyone else's. If you use your position as part of a large, suffering group to demand of politicians that they take money from others to bail you out, you are a thief. You are no less so for choosing that modus operandi than if you had broken into their houses and stolen the cash. The attempt was made in America and (for now) robust citizens have seen it off. The market reaction so far, suggests they may have been wiser than their political leaders. Only time will tell. For now, I just wish European democracies worked so well. The Brown Jinx strikes again? I seem to remember our PM backed the Paulson plan? Link: Financial crisis: Bradford & Bingley to be nationalised by Treasury - Telegraph. I have never been happier to be a Russian taxpayer. We pay 13% flat tax and the Kremlin is talking of cuts to stimulate the economy in the face of the financial crisis. On the other hand, both my children are on course to become British taxpayers. I hope I can talk them out of it. Those of you in that sad position will work for many years to pay for this nonsense. If you insulate people (not just greedy bankers, but the foolishly greedy people who over-borrowed to go into buy-to-let or remortgaged to pay for short-term expenditures) from the consequences of their actions, you promote levels of irresponsibility which will bring you back to this point over and over again. Jean-Charles; some hope at last? Link: Jean Charles de Menezes shooting: Inquest begins - Telegraph. The Metropolitan police's firearms and surveillance teams have hired separate lawyers and it is understood they may attack each other over aspects of the failed operation. In criminal law circles (as these police officers will know) this is called "the stiletto defence." That's when two or more accused hire separate lawyers so they can try to blame the others for the crime. It almost always results in juries convicting all of them. This is an inquest, not a criminal trial. The analogy is imperfect. But if the inquest finds that Jean-Charles was unlawfully killed one can hope that the Crown Prosecution Service might finally do its job. If not, we shall finally know that we ordinary citizens' lives are worth less in the eyes of the British law than those of the state's agents. Link: Where is the support for Kez? : Miserable Old Fart | The English Parliament - Building Jerusalem in England. It's a bit rough to suggest that those of us who supported Bloggerheads when it was threatened with libel by oligarch Usmanov, are hypocrites because we haven't also supported a Labour blogger we (or at least I) have never heard of, against a threat of which we were (or at least I was) unaware. Still MoF, though your method of soliciting support is - to say the least - unreasonable to the point of dodginess, let me say that I fully support said unheard-of blogger's freedom of speech. As a libertarian, I support the abolition of all defamation laws. A right to reputation is a ridiculous concept and only serves to lend dangerous credibility to all the nonsense published in the public presses. Far better for everyone to say what they like and for everyone else to be aware that it might well be garbage. Critical thinking is more valuable than reputation. Now be off with you, MoF. Play nicely with the other bloggers and stop trying so hard to live up to your name. Link: Blogpower- Defending the Blogosphere: Blogpower roundup - interesting first impressions. Follow the link above for the latest Blogpower Roundup by Heather Yaxley of Greenbanana. My fellow Blogpower bloggers are doing sterling work and Heather has rounded up a good selection. Link: Garbagegate - A Stealth Tax Compendium. Many scoffed at the the new Libertarian Party's first official policy - to abolish income tax. Yet their calculations suggested that, if UK government spending were reduced to the same level (in real terms) as when Labour took power, the savings would be enough to do it. This implies that had Labour's "stealth taxes" been implemented openly as increases in income tax - they would have doubled the rate. This was simply too much for most to believe. To be honest, I still find it hard to believe myself and am inclined to think the party was unwise to take its first stand on such a controversial platform. It allowed them to be too easily dismissed as cranks. Now someone over at Garbagegate (a new site to me) has taken the trouble to document Labour's stealth taxes. Read it and weep. Then ask yourself, if (a) this list is accurate and (b) the Libertarian Party's calculation of the cumulative effects of those taxes is correct, how well HM Opposition and the media have been doing their jobs in the last decade. To achieve the equivalent of doubling income tax while retaining a reputation for "prudence" and making your opponents afraid to propose tax cuts would be a huge political achievement. While Gordon Brown may go down in history as a loser, his dark arts of political deceit will - I am afraid - be studied and emulated for generations to come. 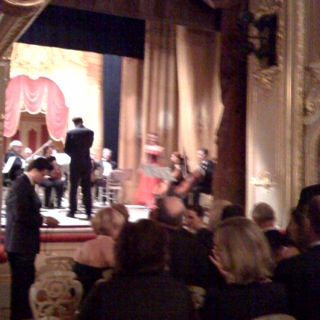 As part of our post-conference festivities, we are watching a musical performance on the tiny but perfect stage of the family's private theatre at the Yusupov Palace in St Petersburg. Several of my favourite posts have been "live blogging" from interesting conferences I have been lucky enough to attend. Today could have been an excellent example but for two problems. Firstly, the topic was the political and economic situation in Russia. As regular readers know, I never write about modern Russia. I am a guest here and it would simply not be polite. Besides, this blog is about civil liberties in Britain. Secondly, I was chairing the discussion, which would have made live blogging tricky. Bruce Clark, the editor of the international section of the Economist, spoke to the "leadership forum" I am attending in St Petersburg. He was the Moscow correspondent of The Times in the early 1990's and has been visiting Russia regularly ever since. He has met several key figures in the region (and was particularly interesting in private on the subject of President Sakashivili of Georgia). He wrote "An Empire's New Clothes" in 1995, a book in which he controversially predicted that Russia (contrary to the then general view) would both prosper and use its prosperity to reestablish its position in geopolitics. He spoke at length, without notes, but with great enthusiasm for a topic he knows well; setting it in an historical context for an audience of businesspeople from around the world. He also gave an interesting answer to the question which puzzles so many of us living and working here, namely why is Russia not (and why has she never been) the richest and most powerful nation in the world, despite having every necessary economic blessing? I am a subscriber to The Economist and - while it doesn't get everything right - am generally in agreement with its world view. It was a pleasure to meet Bruce and to listen to one of the voices in the blend I so enjoy every week. When I met one of my blogging friends last year he told me of his frustration that, while like all of us he often struggles to find something interesting to write about, he could never use his most interesting material, because he works on Ministry of Defence contracts and has signed the Official Secrets Act. Today, though my restrictions are self-imposed, I know how he feels.